Have those winter time colds that spread like the plague started getting to you a bit too much? Before heading out to the doctor, think about reaching into your spice rack. Everything you need could be right there in front of you – and you don’t even know it. Who knew that cinnamon was good for more than mixing with sugar and putting on top of apples and sweet desserts? Cinnamon actually has very strong antibacterial properties and can be used for several ailments in many different ways. For minor cuts and scrapes, grate up a stick of cinnamon, and “paste” it into the wound. The scar that’s left behind after healing will be much less noticeable with this practice. Try boiling a pot of water with cinnamon. Drink it hot with a teaspoon of honey to relieve a congested nose associated with a wintertime cold. This drink will also help relieve seasonal depression symptoms and can help improve arthritis pain. Adding cinnamon alone to coffee or hot tea will help increase the levels of good cholesterol in your body. And just a teaspoon a day has been proven to lower blood sugar levels in type 2 diabetics. Suffering from an upset stomach, nausea or motion sickness? Fix yourself a pot of green tea, add 1/2 teaspoon of ginger per 8 ounces of water, and feel your stomach start to un-wrench itself. Or, if you happen to have fresh ginger on hand, chew on a slice of it for an increased effect. For headache relief using ginger, make a paste with water, apply to the temple area around both eyes, let it sit, and relax. Bad breath? Don’t start brushing your teeth over and over (well, maybe this would help a little…), but chew on a fresh clove instead. Your bad breath will disappear. That nagging tooth ache you’ve been suffering from because of a cavity or a gum infection? Take a piece of a clove (whole or you can crush it) and apply it directly to the tooth that is sore. You’ll start to feel a tingling sensation after a little while, and eventually the pain from the tooth ache will start to fade. This is a particularly good trick right before bed, as tooth ache pain tends to worsen overnight. Chewing on a couple of raw cloves can also help soothe a sore throat. So next time you find yourself reaching for a lozenge, check out your spice cabinet instead! And for those old cooking smells that way overstay their welcome in your kitchen, try mixing cloves with ginger and cinnamon and cooking the 3 spices in a sauce pan for 20 minutes. Your kitchen will sweeten right up, and this trick can be used to replace common air fresheners that may contain potentially harmful chemicals. Mint is not only inexpensive to buy at the grocery store, but it’s so easy to grow your own, and can be used in so many different ways. Use fresh mint leaves as a tea: for every 8 ounces of water, use 1 1/2 teaspoons of dried mint. Prepare like tea and drink like tea to help relieve stomach aches and menstrual cramps. This homemade tea will also help stimulate digestion after a larger than usual meal. Mint is commonly used to help improve mood, so throwing some fresh mint leaves in a bath tub full of hot water and soaking in it will help calm and soothe your body while boosting your mood. You’ll also find that this trick will help in the relief of sore muscles. Not the prettiest of all spices, but this bright yellow wonder can do amazing things for your health and body. Women in India have been rubbing the ground up spice on their faces since ancient times, and although it literally turns your face yellow, it results in clear, smooth skin. Turmeric contains curcumin, which is a powerful antioxidant and anti-inflammatory, and the spice has been used as the common aspirin in Asia for centuries. For fever relief, simply mix 1/2 teaspoon turmeric powder with 1 cup of warmed milk and 1 teaspoon of honey, drink, and relax as your temperature starts to drop. Recent studies at esteemed universities across the world are also now showing that curcumin, the antioxidant found in turmeric, helps to treat Alzheimer’s Disease by working to prevent the abnormal clumping of proteins in plaques in the brain. It’s still too early in these studies, though, to tell if curcumin can be used to treat and prevent Alzheimer’s Disease, but people of India, who mix turmeric with ghee (a clarified butter) so the substance is fully absorbed by the body, have the lowest rates of Alzheimer’s Disease ever reported. Anyone who’s ever eaten spicy food containing cayenne pepper knows how well this spice can clear sinuses. Spicy spices such as this promote raises in body temperature, which can be handy when trying to fend off a fever or increase circulation. People who typically have cold hands and feet consume fair amounts of this spice to help increase circulation to those small areas. You can mix water and cayenne pepper together and use as a gargle rinse to help soothe a sore throat. Or, when sprinkled on a tooth brush or swished against the teeth with water, this spice can also help prevent gum disease and relieve tooth aches (it just might burn a little bit!). Since cayenne pepper is so hot (it is because it contains capsaicin, a resin found in most hot peppers), you can also mix it with water to form a paste, then rub the paste over sore muscles. 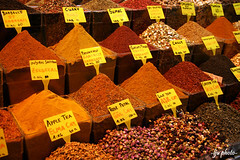 The spice will work its magic with its natural heat and help relieve the soreness. A note: Although these suggestions have worked for many people over the generations, they are only suggestions, and should not be used to replace proper medical care for serious illnesses. These are merely suggestions and ideas to try the next time you have a minor complaint. Any symptoms or complaints persisting more than 5 days should be evaluated by a doctor. Emily Carmichael is a freelance health and wellness writer and wide distributor of natural health supplements such as Detoxamin and herbal remedies. She believes there is a natural answer for every ailment, but still encourages those who are severely ill or injured to see a doctor.